Eva Kano is certainly the kind of performer who thrives in the unexpected. Her sound is not easily identifiable but she is never afraid to explore a wide variety of musical ideas, even when they might sound unorthodox or unconventional. At the core of it all, you'll find Kano's jazz sensibilities. After all, jazz is a musical format that really encourages experimentation and creative thinking, so I couldn't think of a better "ground" for Kano's prolific ideas to rest on. 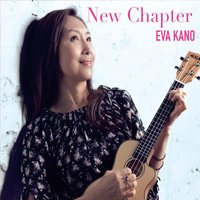 Her recent studio release, New Chapter, will take jazz fans by surprise with inventive original compositions and some stunning renditions of amazing classics performed with an instrument that is not commonly associated with the genre: the ukulele. How could you capture all the intricacies, dynamics and nuances of such a complex genre with an instrument that has such a limited amount of strings and frets? Listen to find out. Kano has a way to capture the emotion behind each track and offer stunning renditions that are far more than just gimmicks, but outstanding interpretations in their own right. Through mesmerizing chords and beautifully arranged progression, Kano set out to unlock the full potential of the ukulele and show the world that this instrument can do far more than just entertain people at bonfires and house parties. Track Listing: 1. New Chapter; 2. It Could Happen to You; 3. Singing You a Lullaby; 4. Why Don't You Do Right; 5. Boplicity; 6. Shadow; 7. Sound of Waves; 8. Stella by Starlight. Personnel: Eva Kano: Ukulele/Vocals (1 - 8), Piano (8); Ben Paterson: Piano (1, 2, 4, 5); Nori Naraoka: Bass (1, 2, 3, 5, 6, 8); Darrian Douglas: Drums (1, 2, 5); Evan Arntzen: Tenor Sax (1, 5), Clarinet (4); Nobuki Takamen: Guitar/Arranger (3, 6); Masafumi Sakai: Guitar/Ukulele/Arranger (7).